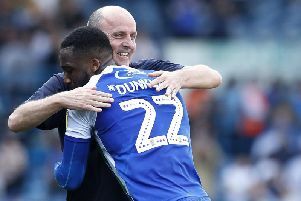 Paul Cook is hoping a glimpse of life outside the ‘comfort zone’ will inspire his Wigan Athletic players to fight their way to Championship safety. Latics return from the international break this weekend against Brentford, looking to pick up where they left off a fortnight ago after hammering Bolton 5-2 at the DW. And Cook hopes a day out spent with the boxers at Blundells gym in Wigan will energise them for the last eight rounds. “The boxing was purely for the mental toughness,” Cook revealed. “Every now and again, in every game, you have got to grit your teeth and dig in, and boxing is probably the best place for that. “It takes you out of your comfort zone and develops mental toughness – and I enjoy the lads coming out of their comfort zone. “Footballers are in a comfort zone. “But now and again, outside and in life, you have to dig in and fight – and we’re certainly in a situation like that. Cook has reported a clean bill of health for the clash, with defender Danny Fox and forward Anthony Pilkington (both knee) returning to the squad after lay-offs.